Dollars and Sense: Five Ways to Find Money for a Hand Hygiene Program. When students, parents and teachers see the PURELL® brand, it sends a clear signal that you care about cleanliness and the well-being of students. In a recent survey, 82% of people said that seeing PURELL® products left a positive overall impression of the facility providing them. Additional spending typically requires board approval, but connecting with enough advocates throughout the school, such as nurses, foodservice coordinators or faculty members can help your cause. Visit the Teacher Resource Center for lots of helpful information on the benefits of a comprehensive hand hygiene program, and the positive outcomes that the PURELL® brand can provide for your school. Hand hygiene is crucial to students’ success in – and out – of the classroom. 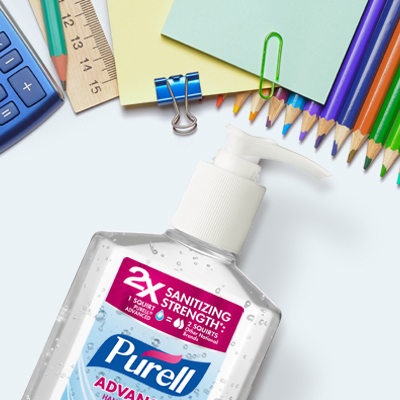 Illness causes 144 million lost school days each year, but research shows that when combined with a curriculum to teach students about good hand hygiene, PURELL® products are proven to reduce absenteeism by 51%. In addition to making hand hygiene products readily available, teaching students how to use them and the benefits they provide, your school can create a healthier learning environment. Check out Healthy Hands 101 for helpful information on hand hygiene, and share with the faculty to support your cause! 2. Benson V and Marano MA. 1998 National Center for Health Statistics. Vital and Health Statistics. Current Estimates from the National Health Interview Survey, 1995. Series 10, No 199. Page 62. 4. Teacher Absence as a Leading Indicator of Student Achievement, Center for American Progress, November 2012.